In this “how to” we will go over installing Ubuntu 10.04 TLS on a Soekris Net4801 SBC (Single board computer). To accomplish this, we will be network booting the Net4801 since it does not have any installation type storage (no cd-rom, and USB ports are not bootable), also since the Net4801 does not have a video card, or keyboard, we will be performing the installation over a serial console. You can use this guide to perform the same function on other SBCs or other devices (even a standard server). The methods in the guide to both network boot, and provide a serial console are not mutual specific and can be done on their own (example, you don’t need to network boot to install using a serial console, or vice versa). In this how to, we are using the Soekris Net4801 since it’s a small, interesting little computer which is designed as a somewhat open platform for router, wireless, and numerous other types of development and production type uses. The Net4801 specifications are available here: http://soekris.com/products/net4801.html. The instructions I provide are using software and systems I have available to myself. Your environment may be different so remember that Google is your friend. The concepts will be the same. When network booting the Ubuntu installer, you can either install directly off the internet (which requires simply networking booting, and following the installation instructions) or you can provide the installer the installation files which may speed things up if you are on a slow connection. For the purpose of enlightening whoever is reading this, we are going to provide the installer the files. The first thing we have to do is create the environment necessary to network boot the Net4801. In my case I have a CentOS 6 server. I installed the tftp server by issuing “yum install tftp-server*”. After this is complete we open up /etc/xinetd.d/tftp and change the disable value to no. Go ahead and restart xinetd by typing “/etc/init.d/xinetd restart”. We now have a TFTP server providing everything inside of /var/lib/tftpboot. In my case, I have a Windows Server 2008 R2 box providing DHCP to my network. I simply log on to the server, and open the DHCP Server GUI. I browse to my network scope, and right click on “Scope Options” and hit “Configure Options”. We need to specify two options: First is “066 Boot Server Host Name” which we set to the IP address of the TFTP Server, and second “067 Bootfile Name” which we set to “pxelinux.0”. That’s it! When the PXE client boots it will receive this information. If you have the Ubuntu alternative CD, you can copy over everything inside of the install/netboot directory to /var/lib/tftpboot. If you don’t have the Ubuntu CD, change your working directory to /var/lib/tftpboot, and type “wget ftp://ubuntu.arcticnetwork.ca/pub/ubuntu/ubuntu/dists/lucid/main/installer-i386/current/images/netboot/netboot.tar.gz”. After this, type “tar zxvf netboot.tar.gz”. This will extract the netboot components to the directory. When this is completed, this will provide the network installer for Ubuntu. Since we are using a serial terminal to install Ubuntu on the Net4801, we now have to configure the bootloader, and installer to use the serial console. Save and close. We have just instructed the bootloader to use the first serial port on the system to provide console. Next we need to configure the kernel to input/output to the serial port aswell. Now that this is complete, the kernel will now input/output to the serial console. If you are installing from the internet, you can simply skip this step. If you have the Ubuntu alternative CD, or CD Image, and want to install from those sources, this is what we need to do. In my case, I had the ubuntu .iso file. On my CentOS server, I have Apache httpd installed. I have the .iso file in /root/. I type “mkdir /var/www/html/mount” to create a directory called mount inside of the web root. I then make sure I’m in /root/ when typing “mount cd-image-name.iso /var/www/html/mount -o loop” which mounts the CD Image to the mount directory. We have now successfully mounted the CD image to the web server. Hook up the Net4801 to your computer’s serial port using your Null Modem Serial cable. Open up PuTTY, and instead of using SSH, use Serial, and set the speed to 19200. I beleive this is the default for a fresh out of the box Net4801, and start the connection. Power on the Net4801 and you should see the startup text. So right now, the connection is working, but I thought I’d go over a few things. Hit Ctrl + P while the BIOS is posting, and type show. These are variables you can configure on the Net4801. A few to remember are: a) ConSpeed – Serial port speed, has to match on both sides b) Flash – Either Primary or Secondary, this specifies whether it is Master or Slave on the IDE Channel, just like traditional older IDE based computers. c) BootDrive – This is standard booting order, 80 = IDE Master, 81 = IDE Slave, F0 = PXE Network boot. Anyways, that’s that. So now we want to network boot. 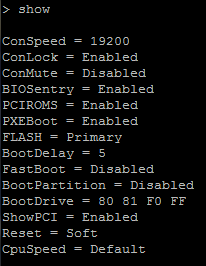 While in the ComBios command console, type in “Boot F0”. This will initiate the network boot. Things might look a bit weird at first, however eventually it will prompt you for something, simply type “install” and hit enter. After the kernel boots, the Ubuntu text installation should start. Now it’s easy and normal. -The Soekris Net4801’s processor is a i586 class processor. Ubuntu dropped support for i586 as of 10.10 and later. This is why I chose 10.04 LTS. -There are issues with the installer on the Net4801. Issue being, after specifying network configuration, once it starts to download the initial installer components, the installer will freeze. Usually the screen goes blank for up to 45 minutes when it is working, however when this issue occurs, it will permanently freeze. 10 Months ago I narrowed down what was causing this, however have forgotten. I think it has something to do with just having a IDE drive connected to the Soekris, I think it started working when switching to Compact Flash for internal storage. After installing, I noticed a bunch of weird things like ureadahead and plymouth crashing on startup (due to lack of resources). Also, some things were not showing up on the serial console which I wanted to (this is because everyone want’s GUI’s these days). That disables plymouth, configures a text console, and shows GRUB on boot. After this is done, run “update-grub” and “update-initramfs -u”. 3) Set time – I don’t know why but my system lost it’s time, maybe my battery is going, for some reason this wasn’t automatic. Have any questions, feel free to leave a comment. Also, sorry about the mess of a post. The test numbers are not exactly correct due to caching Windows performs.